SDCC 2017: You Helped Start a War Trailer: Star Trek: Discovery! Star Trek: Discovery – Lt. Saru (Doug Jones), First Officer Michael Burnham (Sonequa Martin-Green) and Captain Han Bo Georgiou (Michelle Yeoh) – Photo courtesy of CBS/CBS All Access. The SDCC 2017 trailer for Star Trek: Discovery turns the wistful I’d Love to Change the World into a dirge. This new, explosive trailer features space battles; Cmdr Burnham in the brig; Klingons speaking Klingon (we’re told there will be sub-titles); and Captain Lorca addressing Burnham, ‘You helped start a war. Don’t you want to help me end it?’ All this and Harry Mudd! Star Trek: Discovery premieres Sunday, Sept. 24 at 8:30/7:30c, on both CBS and its streaming arm CBS All Access. Subsequent episodes will stream exclusively on CBS Access. Star Trek Discovery Launch Date Announced! Series To Run In Two Chapters! CBS Access has announced that Star Trek: Discovery will launch on CBS on Sunday, September 24th (8:30/7:30C). Subsequent episodes will be released exclusively on CBS All Access on succeeding Sundays. The two-hour series premiere will be available on CBS All Access immediately following its CBS screening. The fifteen-episode first season will be divided into two chapters: the first eight episodes will run from Sunday, September 24th through Sunday, November 5th; the second chapter will begin in January, 2018. Star Trek: Discovery Begins Production! Star Trek: Discovery has officially begun production. The series is the first Trek series to have a non-captain as the lead character (Sonequa Martin-Green’s Lt. Cmdr Rainsford, aka Number One). 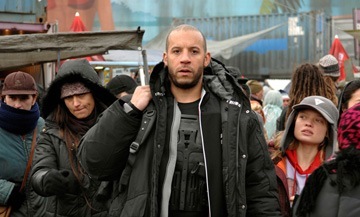 MOVIE REVIEW: Babylon A.D. –Even The Director Thinks It’s Bad! How to explain Babylon A.D. … Okay, how about this: Babylon A.D. is the movie Children of Men would have been had it been directed by Ridley Pearson and edited by Ed Wood. Vin Diesel’s Toorop is the Clive Owens character; Michelle Yeoh’s Sister Rebecca is the Julianne Moore character, and Melanie Thierry’s Aurora is the girl whom Toorop must deliver from Russia to the United States – and for a similar reason. Director Matthieu Kassovitz is on record as saying that Babylon A.D. is not the film he made – that it’s been re-edited by the studio and is vastly inferior to the film he created. Judging from the mangled editing of the many fight sequences [and you thought Batman Begins’ fight sequences were hard to figure out] and the drastic changes in overall tone from epic and sweeping to grungy and claustrophobic, I’d have to say that it’s entirely possibly that he’s right. Diesel is energetic and hard as Toorop, but we probably were expecting that. Yeoh is enigmatic and wise as Sister Rebecca, but that’s not asking much of her. The surprise comes from Melanie Thierry who is quite possibly too ethereally beautiful to be believed – either that or the camera just really, really loves her. It’s hard to tell if Eric Besnard’s script is any good because of the editing. God knows, there are enough signs of intelligence and, possibly, wit here to suggest that it might well be very good. The only problem is that whatever there might have been to add surprise and freshness to this unexpected hybrid of Blade Runner and Children of Men has been excised – leaving us with something that neither involves nor satisfies. I hope Kassovitz gets a Director’s Cut when the DVD comes out. I’d love to see why he’s so adamant that the theatrical release is not the movie he made. MOVIE REVIEW: The Mummy: Tomb of the Dragon Emperor – Uninspired Sequel Bores! The first two Mummy movies may not have been critical successes, but they did have an off-kilter charm that made them hits with the masses. As one member of those masses, I have to say that I did enjoy them, myself. So, why then, do I not care for the third instalment in the series? Writer/director Stephen Sommers only produced this film. They recast Evelyn O’Connell – and Maria Bello ain’t Rachel Weisz, not by half. Luke Ford, who plays the O’Connell’s grown son, Alex, has the charisma of a box of Shreddies. Brendan Fraser, who threw himself into Journey to the Center of the Earth, seems to be going through the motions here. John Hannah’s exclamation, “I hate mummies! They never play fair!” is the height of the wit in this installment’s banter [you know you’re in trouble when Hannah has to force his dialogue…]. The action set pieces – and the CG, for that matter – have a been there/done that feel about them. On the plus side of the ledger, we have Jet Li, whose energetic and charismatic villain might have been fun if he’d a script worthy of him; Michelle Yeoh, who manages to rise above the morass that is this film, as an immortal witch whose one true love was drawn and quartered by Li’s Dragon emperor, and Isabella Leong brings some badly needed spirit to the proceedings as Lin, the witch’s equally immortal daughter, who incomprehensibly develops a thing for Alex. 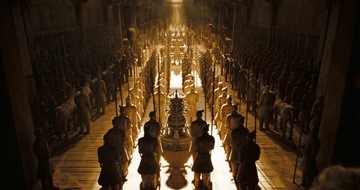 Despite director Rob Cohen’s best efforts, The Mummy: The Tomb of the Dragon Emperor galumphs along at a lacklustre pace for a would-be summer blockbuster. If it wasn’t for the performances by the key Asian actors, this would be a complete disaster. Thanks to them, there are enough bright spots to avoid an F.